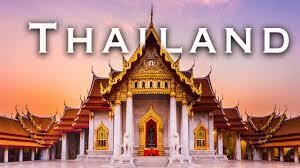 Thailand is one of the most popular tourist destinations in Asia. It’s tropical climate, delicious cuisine, and active nightlife draws tens of millions of tourists every year from around the globe. Its capital city of Bangkok is one of the biggest flight hubs between Europe and Asia and is also one of the largest cities in the East-Asian region. It should come as no surprise then that Thailand has a very active and diverse economy. Indeed, Thailand is a major producer of various skincare and other healthcare products which makes it particularly appealing to many pharmaceutical companies around the world. As you might imagine, addressing such corporate affairs overseas is not a simple task. There are numerous documents which need to be used in Thailand that are issued outside of Thailand. These include Certificates of Incorporation, Articles of Incorporation, Certificate of Pharmaceutical Products, International Trade Certificates, Certificates of Free Sale, and Medical Device Licenses. However, before these documents can be used in Thailand they have to go through a process that ensures they are legitimate. You may have heard of the apostille process and it is possible you have even been instructed to get your Canadian document apostilled for use in Thailand. What is not widely known is that neither Thailand nor Canada are signatories to the Hague apostille convention. This means that they both use the original process that was in place prior to the apostille convention. This two step process is known as authentication and legalization and is recognized internationally as being equal to an apostille. If you have Canadian documents that need to be used in Thailand or elsewhere in the world, they will have to go through this process to be valid for use there. Authentication and legalization is an easy process to understand but a difficult one to do. It involves validating the signatures of recognized authorities which verify the legitimacy of a document. Before this process can begin, your Canadian documents must contain the signature of such an authority, usually a lawyer or notary public, which is recognized by Global Affairs Canada. Once their additional requirements have been met, the agents at Global Affairs Canada will authenticate your documents, or specifically the signature on your documents, by placing their own stamp, seal, and signature on the documents. This step can take as long as 20 business days for documents they receive by mail or courier. Upon completion of authentication, your documents are now ready for legalization at the consular section of the Embassy of Thailand. They will also request a series of requirements and fees which are subject to change and have their own processing time for legalization which can vary substantially. Once these requirements have been provided along with the authenticated documents, the consul will legalize your documents which makes them valid for use in Thailand. As you can see, this can quickly become a very confusing and time consuming process to go through. Indeed, without assistance it can take months to complete properly. This can be a very big problem as there are deadlines that need to be met and in many cases cannot afford to be missed. It is for this reason why thousands of individuals and businesses choose the alternative: ALSC. We served our first client over 25 years ago and since then we have helped tens of thousands of Canadian individuals and businesses with their documents for use in Thailand and over 100 other countries. We are experts in all manner of Canadian documents including Medical Device Licenses, Corporate Powers of Attorney, Certificates of Incorporation, Articles of Incorporation, Birth Certificates, Police Checks, and University Degrees. Since our foundation we have remained the leaders in our industry and have developed a process that has become the gold standard for authentication and legalization services. Global Affairs Canada and the Thai embassy are both located minutes away from our office. This allows us to present your documents on your behalf to their staff during their limited operating hours and have them completed up to 20 days sooner on our priority same business day authentication service. We also offer a standard 3 business day service and economy 10 business day service which may better suit your needs if you need to process multiple documents on a budget. Regardless of the service speed you choose, you save time and receive our service guarantee: assurance that your documents will be made valid for use in Thailand or elsewhere. Although we cannot influence the processing time at the embassy of Thailand for legalization, the strong professional relationship we have built with their consular staff over the years allows us to be up to date on their changing requirements and fees sometimes even before they are made public, and easily resolve any issues which may arise. These are just a few of the benefits you receive when you choose our services. You will also have your own agent to personally assist you in arranging the necessary requirements for legalization, and upon reception of your documents they will provide you with detailed updates at every stage. Additionally, our agents will be available at all times during our office hours to address any concerns or answer any questions you may have throughout the process. 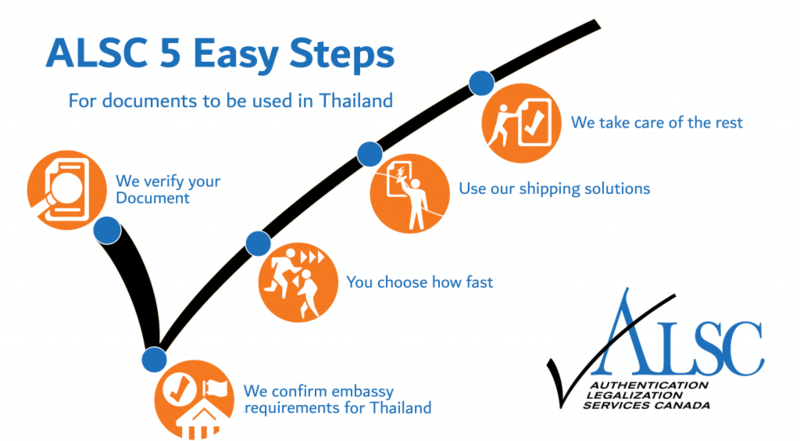 Once your documents have been authenticated and legalized for use in Thailand, we can send them anywhere in the world you’d like them to go via one of our many trusted shipping partners. If you are rushing to meet a deadline in Thailand, we strongly recommend you contact us. We will minimize delays and ensure your Canadian documents are ready for use in Thailand promptly. Continue reading for additional details about some Canadian documents commonly used in Thailand. Every year, thousands of established businesses from all industries vie to put their products on Thai shelves, partner with Thai businesses, and expand their existing subsidiaries in Thailand. Doing so requires a series of documents that need to be made valid for use in Thailand including Medical Device Licenses, ISO certificates, Corporate Powers of Attorney, Board Resolution, CPP, and GMP. As an existing corporation, it is likely that you have many of these documents in an accessible location or are at least familiar with how to obtain them. As with many other Canadian documents, most Canadian corporate documents will require notarization by a lawyer or notary public to be valid for authentication at Global Affairs Canada. This is because most corporate documents do not include a signature that is registered with Global Affairs Canada in their issued state. If your corporate documents have already been notarized take a moment to see if the stamp, seal, and signatures are all done properly and also match. Additionally, make sure the name of the lawyer or notary public is easily legible or if not, since if they are not then Global Affairs Canada will be unable to authenticate your corporate documents. There are some cases where you cannot process original corporate documents for use abroad. This is usually because they are either too valuable to risk being lost or damaged or are very difficult to have reissued. In these cases it is strongly recommended to make notarized copies of your corporate documents. Some documents issued by Health Canada such as GMP certificates, CPP certificates, and ITCs contain signatures that are recognized by Global Affairs Canada which means they do not require notarization and can be processed in their original form. Before you begin the authentication and legalization process, make sure to double check with your requesting party or affiliates in Thailand to make sure you have the appropriate documents for your purposes. This is another common cause of delay and many of our clients turn to us at the last minute to process documents they did not know they required for use abroad. Similarly, it is common that our clients will miss key requirements that they were advised to provide for legalization. Maintaining clear communication with your requesting parties and carefully organizing your documents and any necessary requirements in advance will save you lots of time and money. Don’t risk delays! There is a simple reason why ALSC exists. To learn the process of authentication and legalization thoroughly enough to do it properly takes a lot of practice which is not possible to get since most will go through this process a handful of times in a year or even in a lifetime. Furthermore, since requirements and fees are subject to change, the process may change the next time it is required. Simply put, going through the process of authentication and legalization without assistance may be a waste of time and money in the long run. This is why thousands of Canadians choose the experts every year. However, we know that it can be difficult to trust a third party with your sensitive information. This is why we take every security measure at our disposal to ensure your information is safe at all times. Our proud membership with the Canadian Chamber of Commerce and A+ rating with the BBB are proof that we are committed to the highest quality of service, trust, and efficiency. More importantly, our countless 5-star reviews on Facebook and Google from satisfied clients show that our services are unmatched; we are the best at what we do. As part of our mission to provide the most convenient authentication and legalization service available, we have opened over a dozen service centers across Canada that allow our clients to receive free shipping via FedEx to our head office in Ottawa for processing. We even offer free shipping via FedEx upon return to any one of our service centers for pickup, or can ship your documents elsewhere at an additional cost. Getting your Canadian documents ready for use in Thailand can be very difficult, but it doesn’t need to be. Trust ALSC with your Canadian document needs in Thailand. Get started now!